Today, Lin-Manuel Miranda, the creator and composer of “In The Heights” and the Broadway mega-hit “Hamilton,” released a celebrity-packed single to raise funds and awareness about the devastation in Puerto Rico in the wake of Hurricane Maria. Miranda, who’s of Puerto Rican heritage, has been using his pop power to highlight the U.S. territory’s strife, criticize complacency, and gather support in the weeks after the monster storm ravaged the island on Sept. 20. Last night, the composer went on CBS’ “The Late Show with Stephen Colbert” to feature an admittedly-awkward video of him as a preteen for Nick Kroll and Colbert’s “Puber Me” charitable campaign that encouraged celebrities to share photos of themselves from the age of 13. In the video, 13-year-old Miranda sings Puerto Rico’s praise—literally—and bemoans being back in New York City. Miranda’s appearance on the popular late-night show, pushed charitable giving through the “Puber Me” campaign to over $1 million. Today, Miranda released a more polished music video than the one produced in his preteens. And the world is taking note. 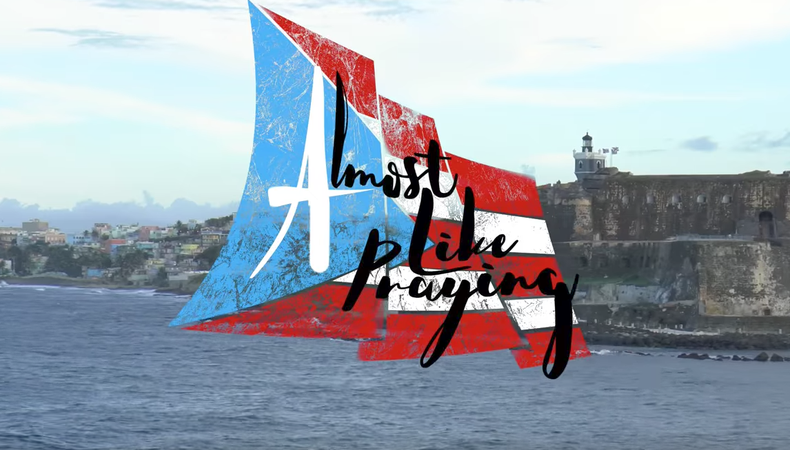 The single, “Almost Like Praying,” derives its name from a lyric in the musical “West Side Story” and features the talents of over a dozen Latino stars from the acting and music worlds including EGOT winner Rita Moreno, actor-singers Marc Anthony, Rubén Blades, and Jennifer Lopez; Broadway stars Anthony Ramos (“Hamilton”) and Ana Villafañe (“On Your Feet!”); Gloria Estefan, John Leguizamo, and Gina Rodriguez; rappers Fat Joe, Dessa, and Joell Ortiz; plus well-known Hispanic singers Juan Luis Guerra, Luis Fonsi, Pedro Capó, Ednita Nazario, Camila Cabello, Gilberto Santa Rosa, PJ Sin Suela, and Tommy Torres. Trump continued to elicit astonishment when he attacked the mayor of San Juan, Carmen Yulín Cruz, and jocularly tossed out paper towels to throngs of storm victims during a recent aid trip. As of press time, the music video was the No. 2 trending video on YouTube. Financial proceeds from the song benefit the Hispanic Federation’s Unidos Disaster Relief Fund. If you would like to contribute to the cause, Miranda’s single can be downloaded here. And you can watch the video below!